Is he or isn’t he? Only his imams know for sure… — 1389 Blog - Counterjihad! After having weighed the evidence, I would argue that Obama is, indeed, a Muslim. You may, of course, look at the same evidence and come to a different conclusion. 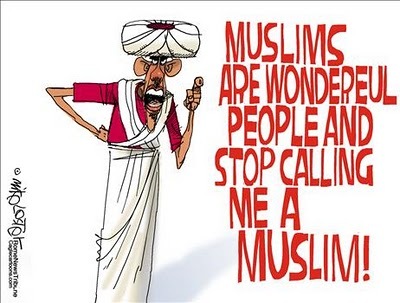 Keep in mind, though, that I have never claimed, nor do I wish to imply, that Obama is a devout Muslim at all. But he need not be a devout Muslim in order to be a dangerous one. Don’t try to tell me Obama is not a Muslim! While Obama has correctly been accused of being “tone-deaf” to the sensibilities of Christians and Jews, as well as to the struggling American citizen and taxpayer, he has always been exquisitely in tune with making life easier and more comfortable for practicing Muslims at home and abroad. …The Illinois Halal Food Act is unique in the sense that it is a new bill and not an amendment, whereas the New Jersey and Minnessota Bills were amendments made to the already existing Kosher laws. It additionally contains provisons on the regulation of Halal farm. In the Obama Administration’s latest effort to appease Muslims, the U.S. government will begin delivering special meals, prepared according to Islamic law, to home-bound seniors in a city known for its thriving Muslim population. Alhamdullilah, there is a growing movement in the U.S. to revolutionize how and what we eat. First Lady Michelle Obama, celebrity chefs like Jamie Oliver, and well-known food writers such as Michael Pollan and Alice Waters are heading up this movement through books, documentaries and lectures across the country. Call it “guilt by association” if you like, but this just makes me want to get a pint of beer and some pork sausages, and to vow to ignore everything written or said by those other “food writers” or “celebrity chefs.” These hipsters and self-ordained food Nazis irritate me just about as much as the Muslims do, in part because they take every opportunity they can get to make inroads on our freedom. The real issue, however, is not how much of a Muslim Obama is, but how much he is serving the Muslim agenda – an agenda inimical to the interests of the US and its citizens. How do Obama’s socialist and anticolonialist roots fit into his pro-Muslim agenda? Perfectly, as it turns out. I keep hearing people say that Obama cannot be a Muslim because he is a socialist, or because he is a Third World anticolonialist. Problem is, none of those things are mutually exclusive. I have said before that Islam is not a religion in any normal sense of the word, but an expansionist, enemy, totalitarian political ideology that seeks to rid the world of everything other than itself. That having been said, Muslim ideology also allows Muslim governments and organizations to use, co-opt, and sometimes take over, other corrupt individuals and organizations, and other totalitarian systems. One example is the pro-jihadi socialist George Soros. Soros has revived “democracy” in the original sense of mob rule, using astroturf political movements and corrupt NGOs, hired mobs, and electoral chicanery to put Obama into power in the US and other corruptocrats into power elsewhere. Soros has arguably done more than anyone else to weaken Judaeo-Christian civilization and to further the jihadi agenda worldwide. While his supporters claim that the puppet governments he has set up in Europe and Asia are pro-Western, that means only that they kowtow to the pro-Muslim agenda of the US State Department. Soros’ real strategy has been to inflict ruin on Orthodox Christian countries so that they can no longer form a bulwark against Islamic expansionism. Soros is no Muslim, but out of his hatred of humanity, he is certainly serving their agenda. When it comes to socialism, be it national or international, Islam has never stood in the way of Palestinian terrorists partnering with the Communists and, earlier, working hand-in-glove with the Nazis. There is much truth in the assertion that Obama’s world view, goals, and agenda are nothing more than a thinly-disguised retread of the shopworn anti-colonialist agenda of his biological father. This topic was explored in How Obama Thinks (h/t: yenta-fada), an article well worth reading for its own sake. Among other things, it reveals that Obama’s father, notwithstanding his Western education and Muslim faith, was what we would call an irresponsible drunken bum. It is a mark of maturity to refrain from following in the footsteps of the unworthy, all the more so when the unworthy are one’s relatives or previous mentors – a maturity that Barack Hussein Obama clearly lacks. But does the anticolonialist and anti-Western agenda Obama inherited from his father mean that he cannot also be a Muslim? It is remarkable how perfectly the anti-Western and, eventually, anti-American, agenda of the twentieth-century anticolonialists merged with the ongoing Muslim agenda of putting the world, little by little, under Muslim hegemony in place of Western hegemony. Because present-day Islam is decentralized, though still totalitarian, it allows local warlords and tinpot tyrants to use Islamic rhetoric as a vehicle for gaining support, shari’a law as a vehicle for establishing power, and jihad as a vehicle for expansionism at the expense of non-Muslim neighbors. Apologists for Islamic rule never call it colonialism, even though it is a far worse form of colonialism than anything Western nations ever did, perhaps because they see Islam as a native Third World phenomenon. What they refuse to acknowledge is that, to a large extent, the Muslim influence is the very reason why so much of the third world is the third world; why it is condemned to remain backward and unfit to live in, even for the Muslims themselves. Their only answer to that backwardness, as it has been since the days of Muhammad himself, is to expropriate wealth from, dominate, and enslave non-Muslims, and these days, that’s the American taxpayer. Can you believe it? We are getting an admission right from Mohammed himself that Obama is a Muslim! Once again, we are addressing our concerns in italics. yes u r right. we don’t want to say a muslim becuse MUSLIM are WONDERFULL PEOPLE………. but YOU & BEHIND U they are MOTHER FUCKER’S & PROUD for it……!!!!! Oh, wait! This cannot be the real Mohammed, who was illiterate. This ‘Mohammed’ can write . . . barely write, but he can do it. Obama Supports Islamist Takeover Of Egypt — 1389 Blog – Counterjihad!